Every week I spin the online roulette wheel. Round and round it goes and where it stops I always know because what I’m metaphorically spinning is the date of next week’s column. The real game of chance begins with the names that show up on that date, actors, writers, artists, major celebrities, world, or national events. While the second spin sometimes leads nowhere, this week’s number brought up two actors: France’s Harry Baur, who was born on April 12, 1880 and died mysteriously in 1943; and Homeland star Claire Danes, who was born in Manhattan on April 12, 1979, almost exactly 100 years after the man who played the most memorable Jean Valjean came into the world. I might have passed Baur by had I not recently viewed five of his films, all from the 1930s. Once you’ve seen Harry Baur doing what he so formidably does, there’s no way you can pass him by. It would be like trying to get around a gale-force wind. Nor is it easy to pass by Claire Danes, alias Carrie Mathison, whose famously expressive face is a force of nature in itself. This past Sunday she wrapped up the sixth season of Homeland with the nation sinking into a level of chaos that makes the Trump presidency look like a walk in the park. The real winnings of this weekly gamble come as soon as you begin looking more closely at the people who turn up on the second spin: finding out, for instance, that Claire Danes played Cosette to Liam Neesen’s Jean Valjean in the 1998 Bille August version of Les Misérables. Look deeper into Baur (and he has depths not to be believed) and you discover a devoted fan in Oscar Winner Rod Steiger (1925-2002), who was born, as it happens, on April 14. Steiger’s way of describing the magnitude of his favorite actor’s Jean Valjean was to say he could “stand still and make a universe around himself.” In an interview given after the release of Al Capone (1959), Steiger claimed that the method behind the ferocity of his Capone was to enrage himself by recalling how the Nazis had tortured and murdered Harry Baur. Any discussion of Baur’s career has to take his grim fate into account. In David Thomson’s Biographical Dictionary of Film, Baur is “a great, noble actor” whose story “is the more memorable because of his tragic end.” In Thomson’s simplified and not entirely accurate version, the catastrophe centered on the actor’s Jewish wife and the fact that he made his last film in Germany, where he was arrested, tortured, released, and “found dead” shortly thereafter. What Baur is doing in his scenes with the Bishop is giving expression to the plural implications of the title, making us know that this is more than one man’s story, it’s about not one “miserable,” but “les miserables.” Baur contains multitudes, suggesting, as Steiger said, “a universe around himself,” and though this is only the beginning of the story, the impression resonates right through to the end when he dons workman’s clothes for the rescue of Cosette’s beloved Marius, carrying the wounded man on his shoulders through the sewers of Paris, in filth up to his chin, merged with his human burden like some mythical creature emerging from the mire. Both times Valjean is not one man but all men, all France. Given the popularity of the film, it’s not surprising that Baur’s death inspired an extraordinary demonstration of anti-German feeling among the thousands who attended his funeral. They were celebrating the spirit of Jean Valjean in Harry Baur. Of the four Julien Duvivier-directed films starring Baur that I’ve seen, Poil de Carotte (or Carrot Top) is the one that won’t let me alone. This at once lyrical and harrowing film about an embattled child overflowing with life and spirit is lifted into a special cinematic realm by Robert Lynen, the 12-year-old actor whose manic genius infuses the title character. The boy’s given name is François, but everyone calls him Poil de Carotte in varying degrees of affection and dismissal, to the extent that the name becomes a dehumanizing synonym for his miserable lot as the scapegoat in a dysfunctional family ruled by a mother from hell (Catherine Fontenay) and a father (Harry Baur) who has lost sight of his child’s despair. Baur brings the same stature to Msr. Lepic that he brings to Jean Valjean, and there’s emotional magic in the sequence when he finally comprehends his son’s misery and the two bond. After Msr. Lepic becomes mayor, however, the boy feels abandoned as his father is swept up in the town’s celebration of his victory. 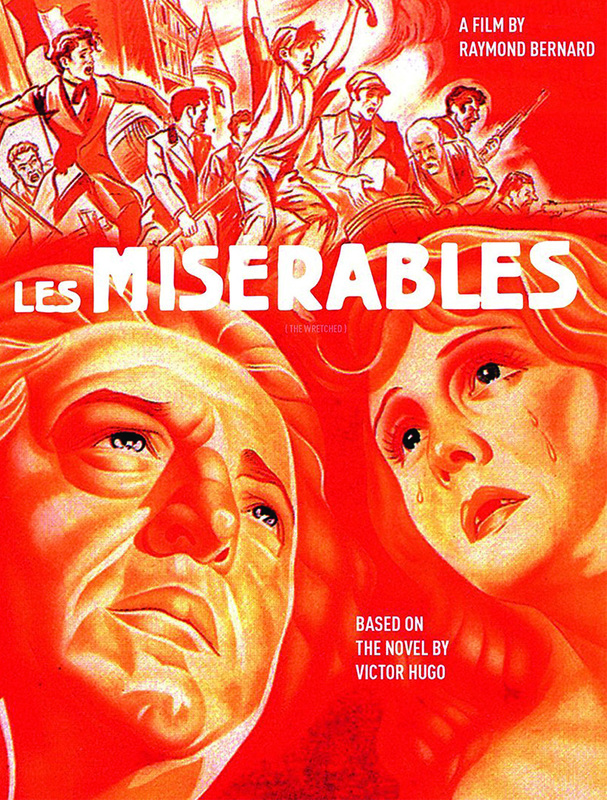 The final scene, in which Baur rises magnificently to the occasion to save his son from self-destruction, apparently moved a nation, for the film proved to be even more popular than Les Misérables, running for a full year in Paris. After a decade of success in the cinema, Robert Lynen joined the Resistance, performing numerous missions before being arrested by the Gestapo in 1943. He was tortured, deported to Germany, and after several months in prison and two escape attempts, he was sentenced to death by a military tribunal and executed, along with 14 other Resistance members, on 1 April 1944 a year and a week after Harry Baur died following his own ordeal at the hands of the SS. The Criterion Collection DVD of Raymond Bernard’s Les Misérables is available at the Princeton Public Library. Criterion’s Eclipse series 44 Julien Duvivier in the Thirties is a 4-DVD set of films all featuring Harry Baur, among then Poil de Carotte.